This is an explosively funny and fun activity to help your students get back into the habit of following classroom procedures and rules, and is especially useful after fall or winter break. 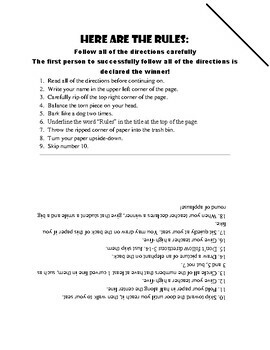 It is a very simple hand-out and will take about 5-10 minutes to complete. I always make sure that when I do this activity with my students, I use lots of encouragement and praise, even for the kids who haven't followed the directions carefully. It should be light-hearted and fun, and I hope you and your students enjoy it as much as mine do!